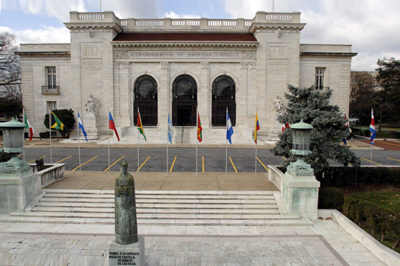 In an effort to make available to the public official OAS documents that are not available in full text, the Columbus Library has digitized various documents collections including: Construction of the OAS Main Building; Columbus Lighthouse Competition; Ad Hoc Meeting of the Ministers of Foreign Relations on Haiti - in the four official languages of the Organization: English, Spanish, French and Portuguese; Bolivia - Access to the Sea, in Spanish and English; collection of photographs of Costa Rica. We appreciate the collaboration of the volunteers Ms. Eunice Lluberes and Mrs. Olga Echeverría for their valuable collaboration and research. If you are interested in these documents, please contact the Columbus Memorial Library. The Online Catalog and the public card catalog are usually the first places to look to locate bibliographic information. The online catalog includes the records corresponding to the books and serials catalogued since 1980 to the present. The cornerstone of the Administration Building of the Organization of American States was laid on October 12, 1948. 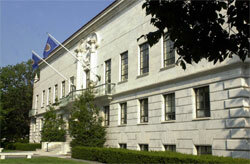 The building is located on Constitution Ave. between the Eighteenth and Nineteenth Streets, NW, Washington D.C. It is a white marble and steel, three-story building, designed by the architects Harrison, Livingston and Larson of Philadelphia. The Assistant Director was called Secretary until 1910. The Assistant Secretary General shall be elected by the General Assembly for a five-year term and may not be reelected more than once or succeeded by a person of the same nationality. Art. 114, Charter of the OAS. The Columbus Memorial Library has digitized the Organization’s Official Documents on Bolivia and the outlet to the Sea in Spanish and in English. For more information please contact the Library at CMLibrary@oas.org. The Eight Meeting of Ministers of Foreign Affairs met on the basis of the Rio Treaty in Punta del Este, Uruguay, in January 1962 to consider Cuba's changing foreign relations and political activities. Organization of American States. General Secretariat. Department of Legal Affairs. Inter-American Treaty of Reciprocal Assistance: Applications, v. 2, 3d. ed., v. 3, pt. 1. Washington D.C., General Secretariat, 1973, 1976. La competencia de la Comisión Interamericana de Derechos Humanos y las obligaciones internacionales de Cuba en la materia / F. V. García-Amador. University of Miami, Institute of Interamerican Studies, 1984. 49 p.
Cuba and the Inter-American System: Exclusion of the Castro Regime from the Organization of American States / Edward Alden Jamison. The Americas, Washington, D.C., v.36, n.3, Jan. 1980. p. 317-346. 1890-1893 William E. Curtis U.S.A.
1897-1898 Joseph P. Smith U.S.A.
1899-1905 W. W. Rockhill U.S.A.
1905-1907 William C. Fox U.S.A.
Dr. Leo S. Rowe was the Director of the Pan American Union until his death on December 5, 1946. Alberto Lleras Camargo (Colombia) was in office from June 4, 1947 to July 31, 1954. When the OAS Building located at Seventeenth Street and Constitution Ave., N.W., Washington D.C., was completed in 1910, it was considered the architectural wonder of its time. One hundred seven years later, the building's tropical patio, marbled staircases and galleries, and monumental halls continue to delight the thousands of tourists and diplomats who visit the elegant structure every year. The Secretary General of the Organization shall be elected by the General Assembly for a five-year term and may not be reelected more than once or succeeded by a person of the same nationality. Art. 108, Charter of the OAS. On September 11, 2008, Dr. James Hadley Billington, Librarian of Congress, and José Miguel Insulza, Secretary General of the OAS signed a Contribution Agreement to develop the World Digital Library. Pan American Day is celebrated annually as a "commemorative symbol of the American nations and the voluntary union of all in one continental community" marking the anniversary of the day in 1890 when the Pan American Union was established.